Delta starting pitcher Jacob Buchhop fields Brooks Gype’s sacrifice bunt and throws to first base for the out. The Panthers fell to Wauseon by a final of 13-1, bowing them out of the tournament. Brady Rupp scores a run for the Indians Monday against Delta. Jason Beverly drills an RBI double in the bottom of the third inning for Delta. Beverly paced the Panther offense with three hits. 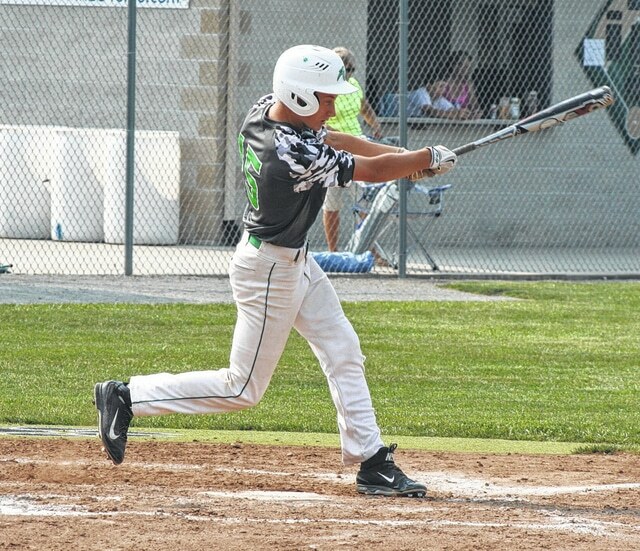 NAPOLEON – The Wauseon ACME baseball team, in a rematch from a game Sunday in which they lost 8-6, defeated Delta 13-1 Monday afternoon to advance in the sectional baseball tournament at Napoleon’s Booster Field. In the match-up with Delta, the Indians pegged a pair of runs in the top of the first inning. With one out, JJ Kauffman singled and moved to second on a balk from the Panthers’ starting pitcher. But after a Wauseon ground out, Brady Rupp reached on a fielding error, a play that scored Kauffman to make it 1-0. Rupp was then brought home when Carter Bzovi doubled. This extended Wauseon’s lead at 2-0. The Indians did not add to their lead any more in the first, however, they would in the second. Jacob Raabe kicked things off with a leadoff single, where he was sacrificed to second thanks to a well executed bunt by Brooks Gype. The bases were then loaded up as Everett Bueter was hit by a pitch and Josh Whitcomb got a bunt single. Gype scored the easy way off Jacob Buchhop’s wild pitch, whereas Kauffman’s fly to the outfield that was mishandled plated two more and the advantage was 5-0 in favor of Wauseon. An out later Brady Kinnersley singled and an error by the Panthers made it 6-0. Bzovi’s two-out grounder that was bobbled scored Kinnersley to complete the seven-run second. Delta’s Aaron Abbott opened the home half of the second with a single to right for the Panthers first hit of the game. A ground out advanced Abbott to second, while Buchhop followed that with a bloop single. Both runners moved into scoring position on a wild pitch. However, Owen Jagodzinski grounded out to first, and Abbott was caught halfway between third and home to complete the double play, ending the inning. In the third the Panther offense finally broke through, beginning with a leadoff hit by pitch to Ronnie Vargyas. He moved up after a ground out, then scored when Jason Beverly hammered an RBI double to left. Delta then chose to go with Owen Tedrick in favor of Buchhop on the mound to begin the fourth. While he still relinquished three runs in his three innings of work, Tedrick kept the Wauseon hitters off balance for the most part. It began shaky for the right-hander as Whitcomb led off the fourth with a double to left center and Kauffman followed with an infield single. With one gone Whitcomb stole third, allowing Rupp to score him with his sacrifice fly to left. A Bzovi single scored Kauffman, increasing the advantage at 9-1. Tedrick would keep Wauseon off the scoreboard in the fifth as he used his curveball to strike out a pair of batters and also stranded a two-out single to Gype. Kauffman knocked in an RBI in the sixth, Whitcomb on a bases loaded ground out scored another in the seventh, and Kauffman’s two-run single in the seventh closed out the scoring. Brady Rupp got the win on the mound for the Indians as he tossed a complete game, allowing seven hits while striking out seven. Kauffman was stellar offensively for the Indians as he reached base five times, recording four hits and driving in three runs. Beverly was 3 for 4 and knocked in the lone Delta run. The Indians also added a 6-2 win over Napoleon in the nightcap, forcing an extra game to decide who would get the top seed heading into the upcoming district tournament at Perrysburg’s Jim Leyland Family Field. That contest, which was supposed to be played Tuesday, was postponed to Wednesday as a result of inclement weather. The Indians were victorious in the rematch, 3-2, making them the top seed out of the Napoleon Sectional. Their next contest is in the district tournament, Friday at approximately 6 p.m. against Findlay.